Dave Splash Dot Com: Target Saves the Troops Only to be Killed By Accident in an Animal "Shelter"
Target Saves the Troops Only to be Killed By Accident in an Animal "Shelter"
Such a sad story. Apparently the hero dog, Target, who along with two other dogs thwarted a suicide bomber attack in Afghanistan, was accidentally euthanized when he escaped from his new owner's yard. From today's New York Times, "When a suicide bomber entered an American military barracks in Afghanistan in February, it was not American soldiers but Afghan stray dogs that confronted him. Target and two other dogs snarled, barked and snapped at the man, who detonated his bomb at the entrance to the facility but did not kill anyone. The dogs were from the Dand Aw Patan district, in the eastern Paktia Province near the Pakistani border. 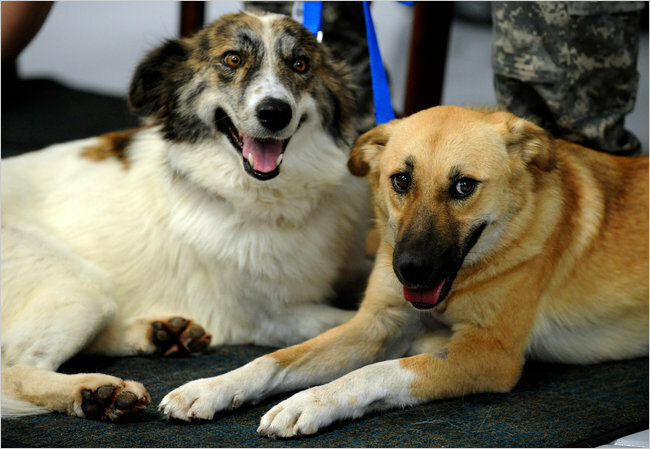 One died of wounds suffered in the blast, and months later, Target and the other dog, Rufus, were flown to the United States by a charity and adopted by families. Target — who received a hero’s welcome, including an appearance on 'The Oprah Winfrey Show' — went to live with the family of Sgt. Terry Young, 37, an Army medic who witnessed the animals’ bravery that night and helped treat the dogs and several American soldiers who were wounded." The dog was spotted roaming around and Pinal County Animal Control caught him. Because the dog had no way to be identified - no tags and no microchip - he was put in a pen with other dogs waiting to be processed. According to the animal shelter, an employee in charge of euthanizing the dogs, chose the wrong dog, and accidentally killed Target. The community is justifiably outraged. Hopefully, this will help with the efforts to make all animal shelters "no kill" shelters, so this kind of thing will not happen to anyone else's pet. Incredibly irresponsible animal "shelter"------what a travesty.